One of the leading headphones manufacturers, Sony make headphones that accurately deliver sound the way it was meant to be heard. Sony noise cancelling headphones are great for commuters as they help distract from the noise of trains and buses when travelling to and from work. Each pair of Sony headphones is made with performance in mind. They come in a wide range of types and styles including in-ear and on-ear versions so there’s always a pair that are perfectly suited to your needs. Even cheap Sony headphones are solid and hard wearing so they won’t let you down. Take your Sony headphones wherever you go and add your own soundtrack to life as you make your way through the city or countryside. Whether you listen to house, techno, classical music or rock, Sony headphones produce clear and impressive sound even on bass heavy music such as hip hop or RnB. The Sony MDR-ZX330BT are wireless Bluetooth headphones that are perfect for home use or for when you’re out and about. They deliver crisp, fully immersive sound that will compliment any type of music. 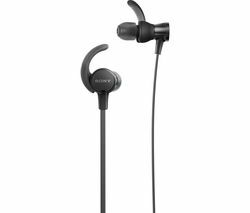 If you want to soundtrack your journeys or enjoy music at home without annoying the neighbours then a pair of Sony headphones is the ideal solution.